Steve captures sacred geometry in motion. Seven shimmering, spiraling, gravity-defying musical mandalas create a kind vibrancy and energy that feeds the senses in a way that only nuanced, emotion-filled sequencer-based music can. At the same time, an overall atmosphere of tranquility permeates the listening space as each spiral meditation unwinds into the elegant beauty of the next piece, revealing delicate lattice-like melodic and rhythmic strands woven into intricate patterns. Created in the Timeroom in 2013, this is music to invigorate the heart, mind, spirit — and imagination. Occorre il classico pallottoliere dalle biglie colorate per catalogare numericamente il lavoro del compositore statunitense in venticinque anni di carriera; eppure la musica di Steve Roach ha il potere di non inflazionarsi, e anche stavolta la mente genuina e non corrotta di questo splendido manipolatore della materia acustica riesce a stupirci. Perché è sempre oltre la cortina del prevedibile, un passo al di là dello scontato. Vivendo la composizione come perpetua ricerca, non solo artistica ma anche armonica, eufonica, non cede mai alla tentazione di clonarsi e autocelebrarsi. Così il nuovo lavoro, ancora una volta alla corte di mr. Rosenthal, Spiral Revelation, è una sfida che si compie nell’esplorare una nicchia in controtendenza, in declino eppure ancora piena di potenzialità: l’Intelligence Dance Music, l’Idm, come se il maestro dell’Arizona si ponesse la causa/effetto di rilanciare una sfida nata anni or sono e cresciuta in nicchie di pregio come Timpanik. Cicli e loop, glitch e spirali vorticiste di suono sono tutte le sicurezze che Roach immette nelle sei tracce del nuovo full-length, con ardore, donando una vita cellulare e molecolare a un sound tendenzialmente algido e artificioso: il tocco dell’artista, la pennellata fine di un pittore espressionista del suono. In ogni traccia regna un’armonia contemplativa, piccole estasi tipiche di Roach; già con “We Continue”, in apertura d’album, nulla è corrotto, nulla può corrompere un suono cristallino, progressivo nelle mille evoluzioni dei rapporti tra synth ed elaborazione concettuale. Ogni suono è un movimento, la frazione ripartita sul complesso di una suite contemporanea, assai affinata con le concettualità di Philip Glass. Un’opera evoluta, nella quale riscoprire ad ogni ascolto nuove ispirazioni, con passiva estasi. Tanti i riferimenti al kraut elettronico, frutto anche dell’esperienza trascorsa, una vita dietro a macchine analogiche e digitali: “Primary Phase” risente dei percorsi “ossigenati” di Jean-Michel Jarre, mentre nel finale la title track riserva quasi venti minuti di assoluta bellezza: la corsa, il flusso di elettroni, di globuli bianchi e rossi, il volo migratorio di oche disperse oltre le nubi, banchi di pesce immersi nel blu assoluto del suono, della vita. The first time I listened to this album, I was having horrible sinus pains. These happen quite often (especially with all the frequent weather changes) and of course I needed some music that wasn’t quite as brackish in which to calm my mind and hopefully soothe the pain. Spiral Revelation did just that for me, and I actually played the disc twice in a row just because I literally couldn’t risk listening to anything else at the time. The disc is largely electronic, as most of his work has been as of late and it feels more active than the meditative atmospheres we are used to. “We Continue” begins the record almost with a crystalline cavern sort of feel, and I can almost hear the water rushing. Slight electronic clicks come into play later, which sees more movement in the waves courtesy of a number entitled “Unseen Hand.” As for “Finger On The Pulse”, it takes us directly into space. I’m often reminded of games, possibly something that might suit the setting inside of a spaceship. It feels very cybernetic, quite vibrant and truly active. “A Righteous Thing” sort of reminds me of Metroid, but many similar soundfonts do. That’s not a bad thing, as anything that feels like it belongs in the atmosphere of an alien world is certainy worth a listen in my book. This one truly feels otherworldly, almost like an obtuse experiment that sounds strangely beautiful. “Primary Phase” brings us right into what I feel befits an office building, yet in the year 3047. It sounds as if busy robots are hurriedly filing reports and sending out parcels throughout the galaxy. Without a doubt, it will have your synpases firing on all levels, which this album manages to do very well. The record itself feels vastly futuristic, making me feel as if I’ve walked into what I’d consider a very productive and utopian future, where the population has now become more machine than man. Though this is not a bad thing either, it just feels like a sort of transhumanist evolution into what might be a more versatile form of life. The record concludes with it’s title track, which is by far the most active of them all. It is nearly twenty minutes long and considered a perfect piece by which to obtain focus and accomplish a task. There’s something hugely unique about this album, and that might be the patterns it speaks to in my brain. One’s head can feel a bit odd while listening to it, which might have been the real reason I sought to listen to it more than once in a sitting, despite it’s length. Ah that the music of Steve Roach is unique! The Master of introspective music ends the year in strength with 3 albums which will caress the senses of his legion of fans, besides attracting to it numerous new followers. If Fade to Grey and Painting in the Dark are purely works of drones and of dark ambiences, this Spiral Revelation overwhelms our emotions with a work which makes the just partition between mesmerizing structures of rhythms and of ambient textures which draw their charms in Steve Roach’s old tones. And the charm operates from these first loops of rhythm which emerge from the slow winged caresses of a synth in mode Structures from Silence. The rhythm is delicate with sequences which scamper towards heavens. Roach adds percussive tones which breathe like an old rattler which has difficulty in making its tinkles shinning. This mixture of electronic and organic tones is more than seducing and diverts us from this ascent of a structure as delicious as Reflections in Suspension with sequences which skip now between the fascinating embraces of the dying rattler. The decoration and the rather ill-assorted tones, both at the level of the color as at the level of the entanglement of the loops of rhythm, are simply hallucinating. Our friend Steve uses brightly the Synthesizers.com analog modular system by weaving many lines of rhythms which criss-cross in some delicious and magnetizing chassé-croisé. “Unseen Hand” infiltrates the finale of “We Continue” with a brook of shinning arpeggios which spreads a fascinating structure in suspension. The motionless movement of the multiple ticklings of sequences is invaded by the numerous bites of metallic elytron and by the caresses of a synth in mode Quiet Music. “Finger on the Pulses” proposes a figure of spasmodic rhythm. Lines of panting and nervous sequences skip and embrace themselves in a surprising movement of trance spiritual of which the liveliness is restrained by another line of a more nuanced and in a harmonic mode rhythm. In addition to the sublime Shadow of Time, a pair of very different collaborations with up-and-coming electronic musician Robert Logan and a stunning archival live release Pinnacle Moments, progressive electronic/ambient icon Steve Roach closes out 2016 with no less than three complete brand-new studio works, all offering glimpses of very different aspects of the artist’s personality, genre bending and constantly exploring musical mind. Of the three, Fade to Gray is a long-form moody drone, and Painting in the Dark a lightly psychedelic pure ambient work, but this one, Spiral Revelation is constantly lively, and, like its colourful cover art, full of a pulsing energy, making it another very welcome and exciting change of direction. `We Continue’ starts the most gently and prettily, an opener that will become an instant Roach classic, holding traces of his early years with the honed intelligence and subtlety he’s mastered over the decades. Whimsical chiming notes ring amongst glistening pools shimmering to the surface with the same joyful and comforting love that flitted through `Reflections in Suspension’ off Roach’s seminal 1984 classic Structures from Silence, a nurturing innocence and comforting embrace at its very core. The fizzy beats of the ringing `Unseen Hand’ skitter out of rising/falling caresses, the relentless `Finger on the Pulse’ unravels with danger, mysterious electronics bleed and seep through `A Righteous Thing’, and `Primary Phase’ is a restrained head-nodding chill-out, growing strident beats and cinematic slivers weaving tastefully together. But the closing twenty-minute title track `Spiral Revelation’ is a masterclass of deeply atmospheric and enigmatic prog- electronica, and is likely a piece that vintage electronic/Berlin school fans will greatly appreciate. Endlessly hypnotic with just a hint of early Klaus Schulze alien danger and the grace of Robert Schroeder’s `Harmonic Ascendant’ but given a modern and vital interpretation, undulating beats grow in presence and rippling unease with subtle surges forwards and retreating waves back, locked forever in an unceasing spiralling loop. A stark pure-ambient coda is exceptionally haunting, and it wraps the disc in a surprisingly emotional and subdued manner. It’s sometimes hard to find the words that accurately bring justice to an ambient work. With a band like Tangerine Dream, you almost only have to mention their name for fans to understand the potential for a good to great album of music. Ambient artist Steve Roach should be at that level for many fans of the genre. With more than 60 creations within his catalogue, not to mention his many collaborations, Steve Roach is (or should be) an instantly recognizable name within the ambient world of sound. His latest album, Spiral Revelation, is a classic album in the making. And I do not say this lightly. Spiral Revelation is a newly released set with six lengthy tracks (yes, you want these tracks lengthy). Beginning with the eleven minute first track, “We Continue”, there is a beautiful and repetitive piece that is bathed in a wash of sound. Occasionally filled in with other sounds, this opening track easily sets the quality of music tone for the rest of Spiral Revelation. As the first track glides into the second, you barely notice a transition has occurred, it’s that well orchestrated. Your mind is completely in tune it simply does not recognize a change. There are two tracks over the ten minute mark and deservedly so. The rest ease between six and ten minutes with two of them quite near ten minutes in length. All in all, this ambient work is an otherworldly masterpiece beautifully composed by one of our ambient masters. 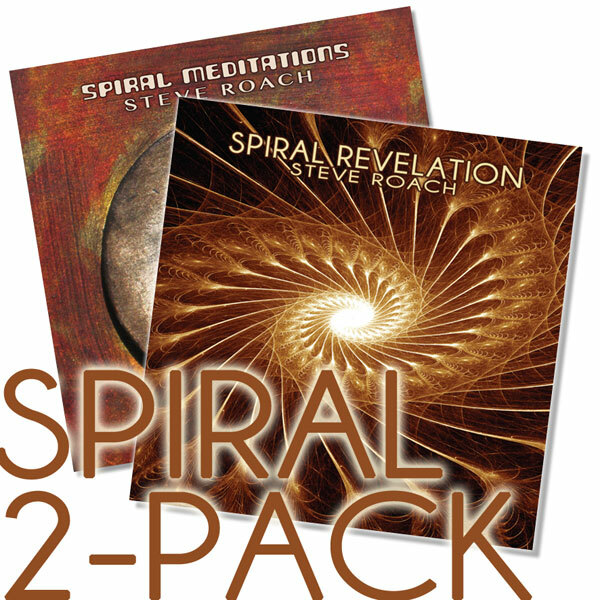 With just over a full hour of transitional tunes, Spiral Revelation should be heard by all fans of ambient music. The album itself is noted as being “The Sound of Life, Interconnected and Unfurling”. Under the disc, within the plastic well that holds the CD, the four (North, East, South West) corners have -appropriately – the words ‘Feeling’, Sensation’, ‘Thought’, ‘Intuition’.